This project will improve safety, ease traffic congestion and reduce travel times for road users on State Highway 1 between Andersons Bay Road and Lookout Point. 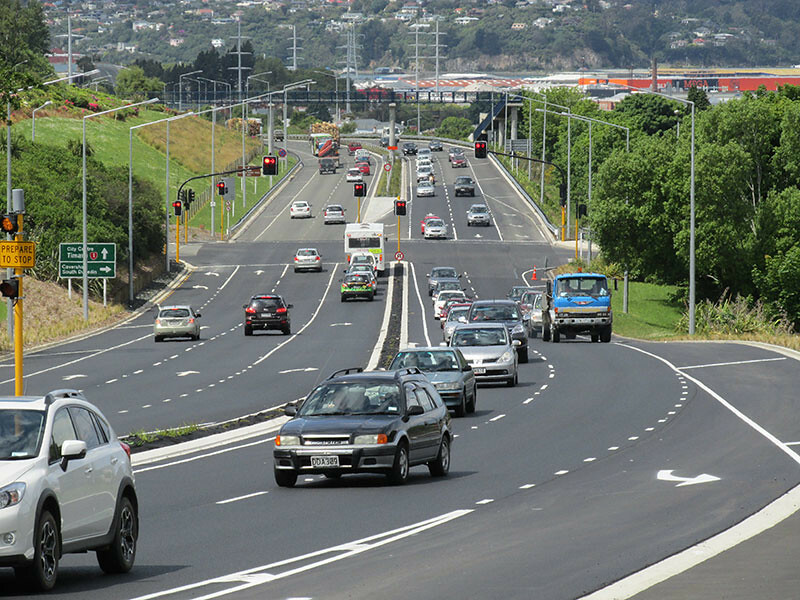 Ease congestion, reduce travel times and increase safety on the 3km section of State Highway 1 from Andersons Bay Road to Lookout Point, which forms part of the southern arterial route into Dunedin. More reliable and reduced travel times. Relief of peak hour traffic congestion. Completes the four-laning of SH1 from Andersons Bay Rd, Dunedin to Mosgiel. General improvement in the movement of freight between the Dunedin city environs and Port Otago. This project involves widening the existing four-lane section of State Highway 1 between Barnes Drive and Lookout Point. Safety will be improved by reducing direct access on to the highway and improving access for property owners on the uphill side of the road. The total project cost including design is between $20m and $25m with construction due to be completed in late May 2015. This stage involves building a four lane highway between the King Edward St over-bridge and Barnes Drive. Construction started in December 2010 and was completed in October 2012. The Construction cost is $19m. Provide a kerbed and planted central median to separate the current two lanes of traffic. Widening the roadside shoulders by 1.5m-1.8m (without parking) and 2.1m or more (with parking). Create service lanes parallel to the highway to more safely provide for residents on this section of highway. Improved intersection layout at Lookout Point including a new bridge over the highway. A shared path for pedestrians and cyclists (uphill only – down hill cyclists will be able to travel on the highway). The South Rd cycle route will be retained. The speed limit will increase from 50km/h to 60km/h. Safety will be improved by closing the Short St link to the highway. A new bridge over the highway will directly link Mornington Rd and Riselaw Rd. 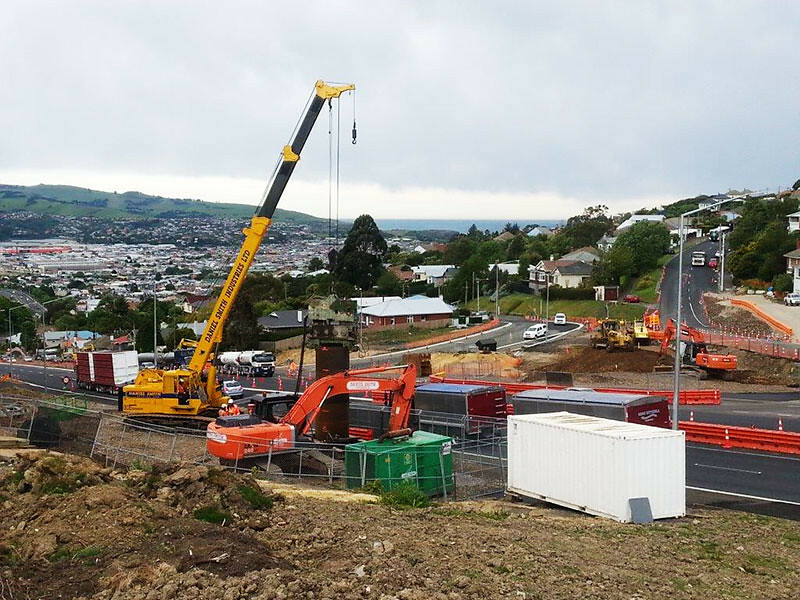 Because Riselaw Rd needs to be lifted to connect to the new bridge, there will be no access from the top of South Rd on to State Highway 1. Stage 1 of this two stage project involving the four-laning of the existing two-lane Caversham bypass from the King Edward St over bridge and Barnes Drive was completed in October 2012. Duplication of the existing 2 lane highway between the King Edward St over-bridge and the Barnes Drive intersection. Median separation (crash barrier), between Andersons Bay Rd and Barnes Drive. Layout changes at Barnes Drive to improve safety and efficiency of this intersection – new left turn lanes, enabling all four through lanes to be dedicated to through traffic. Upgrading and extending a separated walking and cycling route generally parallel to the highway, between Kensington Hill and Barnes Drive. Construct a new two-lane over bridge at the Glen to carry northbound traffic. The existing Glen Bridge will be dedicated to southbound traffic. Extend and lift the Goodall St pedestrian over bridge. Build a 300m long retaining wall alongside the rail line, between Clyde Hill and the Goodall St footbridge. Construct retaining walls along South Rd and Bridge St, on the approaches to the new Glen Bridge. Four other smaller retaining walls will be built in and around the Glen area. Widen and realign the existing carriageway. Provide a central median to divides opposing traffic flows. A new bridge over State Highway 1 that will directly link Mornington Rd, Riselaw Rd and South Rd. 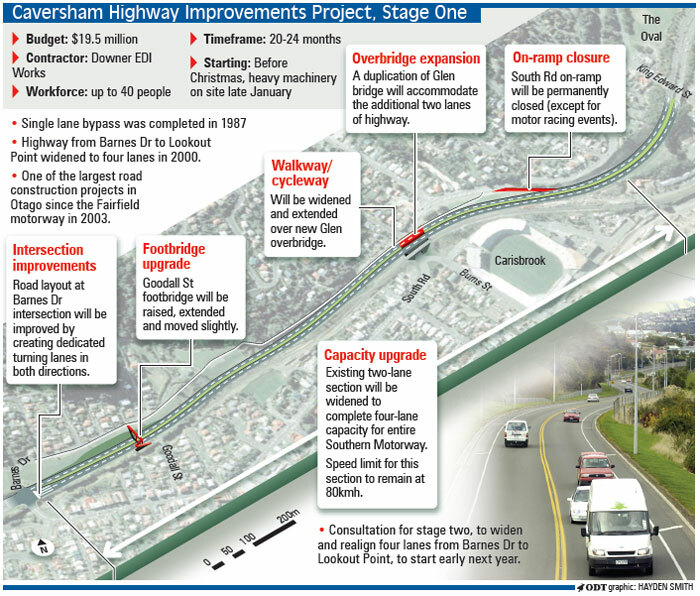 Frequently asked questions about stage 2 of SH1 Caversham Highway improvements. Why is the speed limit changing to 60km/h? the traffic signals at the Barnes Drive intersection. Will there be changes at the Barnes Drive/state highway intersection? There is a new left turn lane for northbound traffic while the right turn lane (into Caversham) will be extended, with the alignment of the four through lanes adjusted to suit. Apart from these changes traffic management measures at the intersection remain the same. Why is there no left turn into Burnett Street from the state highway? As a result of feedback we are reviewing this and will talk some more to Burnett Street residents about what they would like to see happen. In any case, southbound motorists wanting to travel along South Road will be able to access South Road at the base of the hill via the Barnes Drive intersection, or via the new Caversham Valley service lane linking to South Road at the top of the hill. Why is there no link between South Road and Caversham Valley Road? Southbound motorists on Caversham Valley Road can access South Road, via the Caversham Valley service lane. A similar link from South Road to travel south along the highway is proposed. While a new bridge at Lookout Point does simplify the various access movements, the remaining intersection geometry is complex. As a result of feedback, a further assessment is being carried out into options to improve access. The final intersection layout will be decided in consultation with the Dunedin City through publicly notified statutory planning processes. What are the detours as a result of the changes to Burnett Street and South Road? access from South Road would be via either Barnes Drive, Burnett Street, and Sidey Street. Why is a Mornington Road/Riselaw Road Bridge needed? While there are differing opinions on the need for a bridge, the overwhelming view is that a road bridge is the best option to meet the needs of current and future road users in this area. 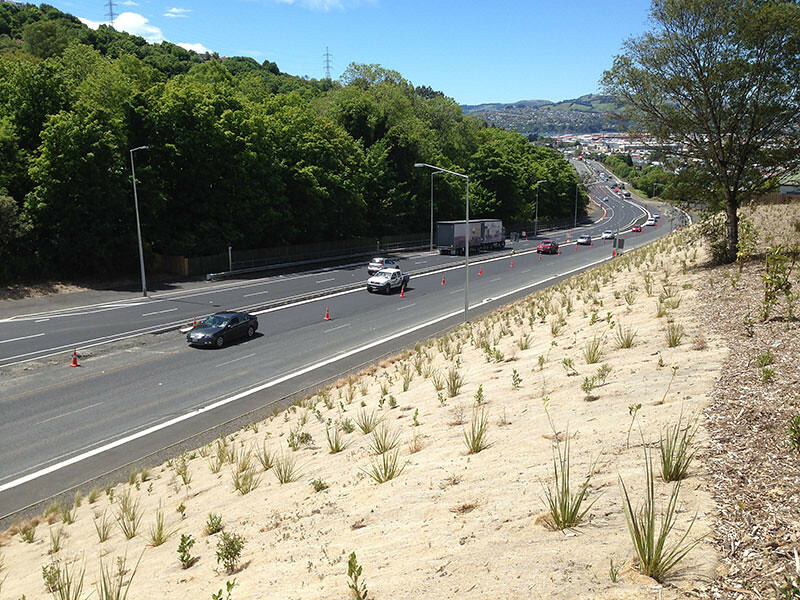 To improve safety, a median barrier is being installed on SH1 from the Barnes Drive to Lookout Point effectively severing the community in this area as there is no convenient alternative route to get across SH1 at this point. A new bridge gives the Lookout Point Fire Service, and other emergency services improved access within Mornington, Calton Hill and wider communities. Why can’t the highway be ‘trenched’ and a bridge put across the top? A trench option was considered, but the construction would need to be confined to between the Lookout Point Fire Station and elevated housing on the other side. In terms of design standards, this is a less suitable option, as it would involve lowering the road by 7.0 metres. This would leave no opportunity to link the highway to Mornington Road, Riselaw Road, or South Road. In a trench, drivers would be unable to see the construction going on around the curve when traveling south. A trench option would have caused considerable and prolonged disruption to the 26,000 vehicles per day using this route. Will this influence traffic speeds on Riselaw Road? A number of residents raised concerns about safety on Riselaw Road. The speed limit on this Dunedin City Council-managed road will remain at 50km/h The planning of new and altered footpaths will be done in conjunction with the Dunedin City Council, to ensure the safety at various crossing points. How will the bus routes and stops change? Why is Short Street being closed? The Short Street intersection, by current design standards, is not ideal largely because of its approach angle onto the highway and there no real scope to improve this. A separate turn lane is needed for northbound motorists turning left into Mornington Road and who need to cross part of the current Short Street intersection. What is being done about traffic noise? Many residents are aware Caversham Valley Road is a busy road, withabout 26,000 vehicles per day, traffic noise is noticeable within this road corridor. Existing and post construction noise modeling shows there will be a small reduction in noise for houses closest to the highway (those adjacent to the uphill section of the highway) because the road is being shifted further away. Further assessment will look at whether there is scope for further noise reduction using measures such as screening. Houses further away from the highway may see changes in noise levels depending on their locality. Overall noise levels are expected to remain within acceptable levels for road traffic noise. Why are has the decision been made not to have ‘no engine brake’ signs? What sort of impact is construction work expected to have? While the construction programming is still being finalised, traffic flows will be managed within the existing highway corridor, although detours via South Road limited will be necessary on rare occasions (eg when the Lookout Point bridge beams are being placed). Ensuring access to all roads and properties and in particular the Lookout Point Fire Station, are high priorities. 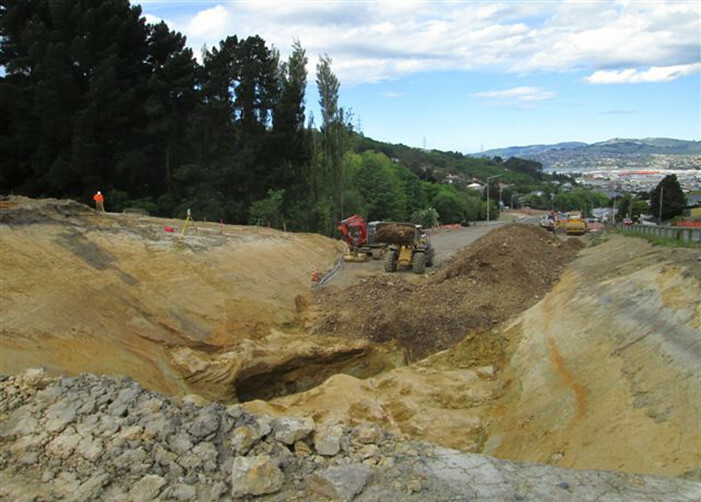 Road users and residents can expect some intersection movement restrictions at Lookout Point when Riselaw Road is raised so it links the new bridge over the SH1. This will also mean temporary traffic layouts from time to time. Every effort will be made so residents and the wider community are aware of these well before they occur.